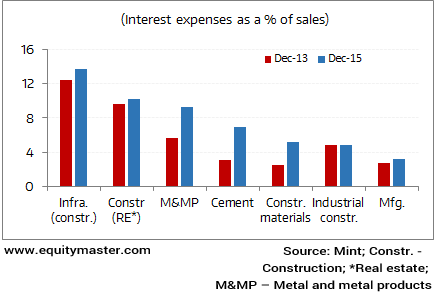 » Will lower interest rates improve profitability of core sectors? Bells don't ring to announce market tops and bottoms. But occasionally, men do climb into the belfry and do it. Warren Buffett is one such man. My most vivid memory of the Oracle's impeccable timing is a brilliant piece he wrote back in 1999. Using interest rates and corporate profitability as his weapons of choice, he destroyed the pervasive myth of the day - that stocks would continue to give strong double-digit returns. Let's keep interest rates aside for the moment and focus on corporate profitability. Now, what do corporate profits as a percentage of GDP tell us? They tell us what percentage of the country's annual GDP wind up in the hands of shareholders of American businesses. If the number is too low, there won't be enough profits. Businesses will shut down, competition will reduce, and profitability will start to rise. What if the number is too high? The reverse will happen. Competition will come in to earn the extra profits, capacities will go up, there will be a fight for market share, and profitability will now start to fall. And don't forget the public policy angle. If investors consume an ever-growing portion of the US GDP pie, some other group will have to settle for a smaller portion. In short, enough corrective measures are in place to ensure that corporate profitability stays neither too low nor too high. There is always a reversion to the mean. Profit margins are probably the most mean-reverting series in finance, and if profit margins do not mean-revert, then something has gone badly wrong with capitalism. Profits were indeed at elevated levels when Buffett warned in 1999. He made a strong case against them rising substantially from there. And he was right. The dot-com crash came just months later. If aggregate profit margin is such a reliable indicator, how about using it in the Indian context? Indian stocks are famous for giving 15% returns over the long term (provided one does not invest in an overheated market). Can this be improved by a few percentage points by capitalizing on the phenomenon of reversion in profit margins? Yes. And the current environment provides a great opportunity to do so. The aggregate data we have pulled for Nifty companies suggests that profit margins were at a ten-year low at the end of FY15. Even if they were to rise to the average of the last ten years, not immediately, but three years out, the upside would close to 70%. Put differently, markets will go up 70% over the next three years if profit margins revert to the mean. And we're not even considering the gains from potential interest rate cuts. The chart below will give you a good idea of what I am talking about. If earnings were to grow at the historical rate of 15% and if profit margins were to rise to the last 10-year average of 13.5% from the current 12.2%, an EPS of Rs 100 can become Rs 168 by FY18, a nearly 70% jump. Therefore, if Sensex follows suit, the index too can go up by as much as 70%, assuming the Sensex PE multiple remains at the current level of around 19x. Investing is a game of probabilities, not certainties. We can't guarantee these returns. Over the long term, though, increasing your exposure to equities when the odds are in your favour is likely to pay rich dividends. And despite the recent run up in stocks, the odds are certainly in your favour currently. PS: Our StockSelect team is already on the lookout for opportunities with an additional upside from profit margins reverting to the mean. In fact, the team recently gave not one but four buy recommendations. Since its inception in 2002, StockSelect has gotten nearly eight out of every ten of its calls right. Click here to know more about this service. Do you think Sensex can rise substantially over the next 2-3 years? Let us know your comments or share your views in the Equitymaster Club. We have released our latest Special Report on the best of the best small caps - Junior Blue Chips! Yes, we believe Junior Blue Chips possess the high growth potential of small caps along with the stability of blue chips. That is an amazing combination every investor would want in his portfolio. And the best part is you can get this report for FREE! With Tata Steel announcing its intent to sell off its UK assets, a lot of write ups have come out relating to this matter. One of which includes how large Indian companies have lost billions in foreign buys. While some believe that the timing was wrong, others believe that the poor commodity prices were out of their control, and thus led to such impairments. In any case, most of the heavy acquisitions have only led to companies destroying value over time. This has largely been a result of Indian companies wanting to spread their wings and meet their global aspirations. And thus, such moves were not surprising. However, aggressive bids only led them to weaken their financial positions, which is a big no-no in our books. Now, this is quite a contrast to a company members of the research team met a few months ago. This company's management is so conservative and conscious about its capital allocation that it did not own any land or building until recently. Its manufacturing facility was on rent all these years - it recently set up an office after it crossed a revenue milestone. As for its management's mentality on capital allocation, it has made it very clear that it would only want to invest in an asset if the payback period is a year or two. Keeping this in mind, it had been patient with its global foray plans too. It now went on to buy two companies abroad. But the interesting part is that these acquisitions barely make up a few percentage points of its total base. While it would be difficult for one to get access such policies of most managements, but, these are the kind of companies that we like and keep an eye out for. Indian share markets were trading firm today. The BSE Sensex was trading higher by 0.3% or 85 points at the time of writing. Gains were seen in stocks across the board with healthcare and power stocks leading the pack. Mid and small cap stocks were in favour as well with their respective indices trading higher by about 0.3% and 0.5% respectively.